a previous head or neck injury is a commonly overlooked cause! 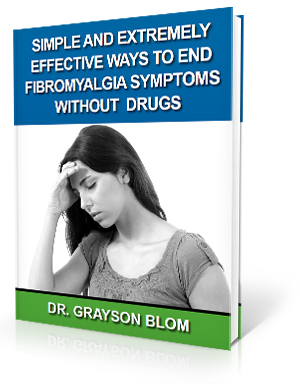 Are YOU Suffering With Fibromyalgia Pain? The Common Denominator May Be An Atlas Misalignment! Most Fibromyalgia (FM) patients suffer with chronic pain, stiffness and burning in the neck, shoulders, lower back and hips. Others experience depression, chronic fatigue, irritable bowel syndrome, numbness, dizziness, headaches or sleeping disorders. Even minor exertion can aggravate the pain and increase fatigue. Statistics show that fibromyalgia is one of the most common musculoskeletal pain and fatigue disorder in America, affecting up to 10% of the population. Fibromyalgia occurs most frequently in women ages 20-50. Sufferers of fibromyalgia usually try the most common medical treatments - pain killers, muscle relaxants, antidepressant drugs, sleeping pills, corticosteroid injections and, in extreme cases, surgery. Unfortunately, the Physician’s Desk Reference reveals that drugs used to treat fibromyalgia can have potentially dangerous side effects. Upper Cervical doctors are getting exceptional results with fibromyalgia patients. Clinical trials and case studies document the improvement fibromyalgia patients are making under upper cervical care. The brain stem, which can be compared to a telephone cable with thousands of individual wires or nerve fibers sending signals between the brain and the body, controls nearly all-vital bodily functions. Misalignments in the upper cervical spine (neck) can affect the function of the brain stem, which can be a critical factor in the development of fibromyalgia and chronic fatigue syndrome. Trauma or compression of the upper neck can cause the same symptoms seen in fibromyalgia or Chronic Fatigue Syndrome (CFS) patients. Fibromyalgia symptoms frequently don't start occurring until years after the initial injury, however in some cases they may appear rapidly depending on the severity of the injury. Although the exact cause of fibromyalgia is not fully understood, numerous studies and clinical trials show that Fibromyalgia often develops after traumatic neck injuries. More than 90% of the fibromyalgia patients we have seen clinically have had and can recall a specific injury to their neck prior to the onset of their fibromyalgia symptoms. Car accidents are by far the most common followed by slips and falls, sports injuries, work related injuries. Dr. Grayson Blom is a Boise, Idaho native that works with a nationwide group of Doctors expertly trained and specializing in the Upper Cervical procedure. Dr. Blom is also one of the few Doctors in the state of Idaho trained and certified in the Upper Cervical procedure. We are dedicated to helping patients just like you who suffer from fibromyalgia, headaches, neck pain, back pain and other spinal-related disorders. To schedule an appointment with Dr. Blom click the button below or call (208) 559-0541.